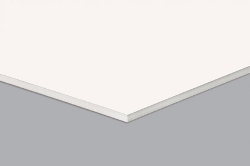 Purelypaper supply a range of Foam-X Print white foam board sheets. This range consists of a lightweight foamboard with polyurethane foam core, and coated with multi-layered bright white paper liners. A choice of thickness is available depending on your requirements, including 3mm, 5mm and 10mm foam board products. In addition, various pack sizes and board sizes can be selected, including A3, A1 and A2 foam board. Foam-X foam board is lightweight, but strong, and can be easily cut where needed. This makes it perfectly suited for applications such as indoor signage, POS signs, shop displays, mounting photographs, photo frames and modelling. Proving particularly popular with model-makers, such as architects, designers and students, foamboard is ideal for such uses due to its quality and ability to produce effective results inexpensively. This product has been specially cut to size. Please see notes in product details page.